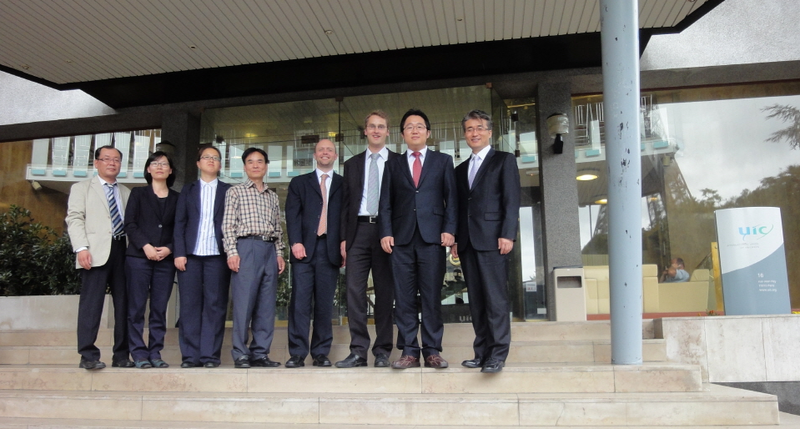 On 21 June 2011, a team of Korean railway researchers led by Dr JUNG Woo-Sung, head of Eco Railroad Research at KRRI, visited UIC HQ, and exchanged knowledge on state-of-the-art technology and research in the field of railway environment. Dr LEE Jae-Young, Senior Researcher at KRRI, along with Mr HWANG In-Hwan, Senior Researcher at KRNA, presented on-going research projects applying novel methodologies to calculate the carbon footprint during the course of railway construction and minimise subsequent CO2 emissions. From UIC, Mr Henning Schwarz, Head of Sustainable Development, Mr Alex Veitch, Senior Advisor, and Mr Paolo Contestabile, Senior Advisor, presented a number of UIC-coordinated European projects including ECO-Passenger, ARISCC and INFRAGUIDER. During two pre-arranged consecutive meetings, both parties agreed to exchange knowledge on state-of-the-art methodologies and technologies, and promote further collaboration and projects including expert meetings. UIC Asia appreciates all contributions from speakers and participants, and welcomes the development of regional and inter-regional collaborations.